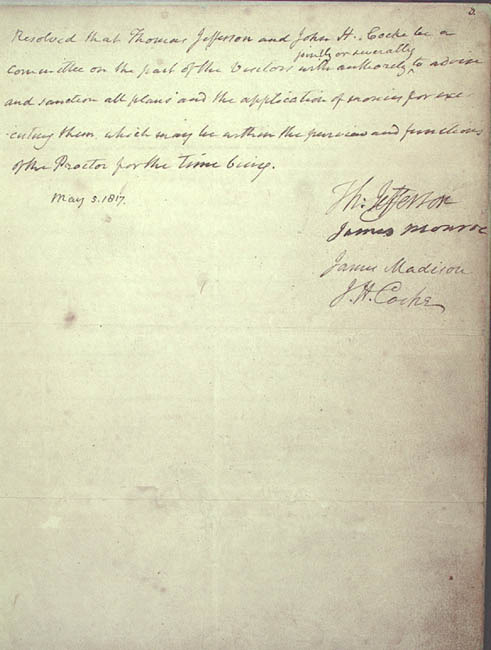 Minutes from the first meeting of the Board of Visitors, 5 May 1817. In February 1816, the General Assembly of Virginia approved Thomas Jefferson's plan for the establishment of an institution of higher learning to be called Central College. The first Board of Visitors for the new college included Jefferson, James Madison, James Monroe, John Hartwell Cocke, and Joseph Carrington Cabell. All but Cabell (presumably in Richmond where he was a state delegate for Amherst County) met for the first time as Visitors on May 5, 1817. At the meeting, whose minutes were taken by Jefferson, they appointed Alexander Garrett as proctor and treasurer, approved land offered by John Perry as the site of the college, directed that work begin on the first building (Pavilion VII), resolved that a lottery and a subscription drive be held to raise funds, and appointed Jefferson and Cocke members of a building committee to oversee construction.